Pilgrims from all over the world toured the Panama Canal near Panama City Jan. 21, the day before the official opening of World Youth Day. Photo: CNS photo/Chaz Muth. Jorge Soto wore a wrestling mask typical of Lucha Libre fighters in Mexico and every few steps he took, others would sidle up to have a picture taken with him. The mask was fun to wear, and it was something associated with his native country, which he was proud to represent at 2019 World Youth Day in Panama, he said. Other pilgrims wore the flags of their respective countries like a cape on their backs: Australia, El Salvador, Guatemala. Though World Youth Day had not officially started, it seemed as if it unofficially began on 21 January on the observation deck overlooking the locks of the Panama Canal, where the young – and the young-at-heart – formed a conga line as some beat the drums and others chanted or cheered to honor the Catholic Church, Pope Francis or Mary. Part of what World Youth Day provides, he said, is a kinship and strength in spiritual beliefs, even if people come from different parts of the world. A pilgrim from Australia meditates during a Jan. 21 tour of the Panama Canal near Panama City, the day before the official opening of World Youth Day. Photo: CNS photo/Chaz Muth. For 16-year-old Charlie Martin of Australia, the event presents the opportunity to come in contact with a physical reality of a Catholic Church that was alive in the Americas centuries before his native country became an independent nation in 1901, one told by the many historic buildings where Catholics in the region worship and where they have built lives of faith. But he also experienced different expressions of that faith than he’s used to. Though most were just passing through to visit the canal, it became clear, by the flags, by the wearing of pins featuring saints and crucifixes around their necks, that most of those gathered at the site of the historic waterway had arrived for more than just tourism. So, even though there was no official plan, some, perhaps inspired by the spirit, just began shouting. 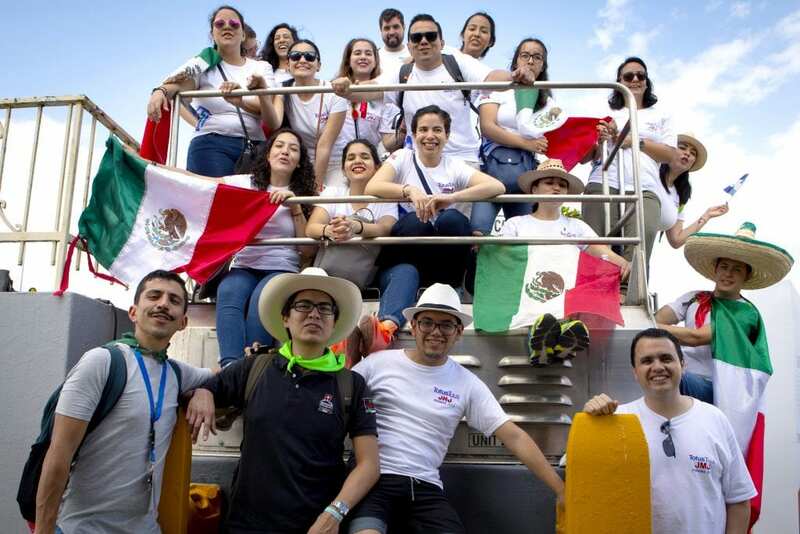 Pilgrims from Mexico pose for a group photo during a tour of the Panama Canal near Panama City Jan. 21, the day before the official opening of World Youth Day in Panama. Photo: CNS photo/Chaz Muth. Even those who weren’t Catholic, such as Jose Gonzalez, a Protestant who was visiting the canal with his Catholic wife, Silvia Lopez, from Huehuetango, Guatemala, were enjoying the moment. Gonzalez said there was much to learn from the experience of faith World Youth Day brings. In fact, it was Gonzalez who encouraged Lopez to attend World Youth Day with him; they just happened to be visiting the canal when the large group of pilgrims arrived. “We’d heard good things about (World Youth Day),” from one of his brothers, said Gonzalez, adding that he was looking for something he and his wife could benefit from spiritually. People with different beliefs need not be at odds with one another, he said, or be afraid to learn from what the other might be able to teach because the goal is the same: unity and the need to make the world better. “It’s a lot of fun to be with them,” Detroit Auxiliary Bishop Donald Hanchon told Catholic News Service.